Are You Training Your Athletes to be Explosive the Correct Way? We can all identify an explosive athlete. Explosiveness is very noticeable, but extremely difficult to train and incorporate into a traditional high school strength program. As a coach for arguably the most explosive athletes on the planet, track and field throwers, and owner of a gym that specializes in building the most explosive athletes in Rhode Island, I have been able to incorporate explosive movement training in ways that are non-traditional but very successful. In this article, you will learn how to incorporate these methods into your own coaching and training to build incredibly explosive athletes. High school and college strength coaches have traditionally been brought up to think of athletic training in terms of maxes. It is what I like to call the “as _____ as possible” mentality. For example, strength is defined as moving a weight “as heavy as possible” one time. A great example of this is a one rep max in the squat. Strength endurance is defined as moving a certain weight “as many times as possible.” The 225 pound bench press for reps test at the NFL combine is a perfect example of this. It is my finding through years of training young athletes and speaking to strength coaches around the country that we are taking the wrong “as _____ as possible” approach when we try to build explosiveness in athletes. More often than not, when a strength coach approaches me and is having trouble getting athletes more explosive, they are incorporating too much maximum weight into the equation. For example, I recently had a coach email me his training template that consisted of Power Cleans, Hang Cleans, and Box Jumps to build explosiveness. While these are great exercises to build explosiveness in athletes, his approach was totally wrong. He had his athletes jumping on to a box “as high as possible” 1 time for multiple sets. He has his athletes doing power cleans “as heavy as possible” for sets of 1 without varying the weight. He had his athletes doing hang cleans “as heavy as possible” for sets of 1 without changing the weight. The thing to keep in mind when training explosiveness is that an athlete will rarely have a heavy external load on their bodies while competing. Using a maximum weight for multiple sets or jumping to a super tall box one time is not building explosiveness, it is merely testing explosiveness over and over again. I believe this is why strength coaches have such a hard time training explosiveness. Unless you have extremely expensive testing equipment, measuring force is nearly impossible. It is a lot easier to measure the weight on a bar, the height of a box, or the time it takes to run a certain distance. Add to this the fact that athletes are asked to be explosive and produce force over and over again during the course of a game and the training difficulty multiplies. Force equals mass times acceleration. So the easiest way to measure force, or for a coach to see if an athlete is applying more force, is to watch the speed that he performs a movement with a selected weight through 5 repetitions. My favorite explosive exercise to do with my throwers is a one arm dumbbell clean and press for 5 reps per arm. It is a full body movement that incorporates massive force with the lower body, transferring that force through the core into the upper body, and applying that force to the dumbbell. Very similar to the way a track and field thrower applies force to a shot put, discus, or javelin. The application is simple. Give an athlete a dumbbell you know they can easily clean and press multiple times. Have them perform 5 repetitions with each hand, starting with the non-dominant (non-throwing) arm. Watch the speed that the dumbbell moves. Ask yourself, is the dumbbell moving as fast (or almost as fast) on the 5th rep as it did on the 1st rep? If the answer is yes, the athlete is allowed to increase the weight of the dumbbell by 5 pounds for his second set. If the answer is no, the athlete should decrease the weight by 5 pounds on his next set. When dealing with training explosion, the name of the game is speed. Being able to keep the same speed (or have a very slight decrease in speed) over 5 reps will ensure that an athlete is able to produce maximum force and replicate that force time and time again, similar to what they will be asked to do during a competition. While I truly believe that having a separate day 100% dedicated to training speed and explosion is the most effective way of getting an athlete to produce more force, it is not possible in a typical high school setting. Let’s face it, practicing the actual sport is the most important thing a high school student will do and should take up the most amount of practice time. If an athlete practices 2 hours a day, 5 days a week, they might only be in the weight room 2 days a week for 30-40 minutes at a time. How does a strength coach go about training explosion with a large team in a small weightroom while the athletes are also expected to be getting bigger and stronger at the same time? One strategy is to combine the strength and explosive movement training into the same exercise. This is something I have done for the past few years and it works very well, especially with large groups. When an athlete is performing a strength based exercise on a typical linear periodization template, they will normally begin with a very light weight and gradually increase each set. Set 1 – 95 pounds for 10 slow and steady reps.
Set 2 – 135 pounds for 8 slow and steady reps.
Set 3 – 155 pounds for 6 good reps.
Set 4 – 175 pounds for 4-5 good reps.
Set 5 – 195 pounds for 3-4 tough reps to failure. Instead, why not add one more set, and work the first 3 sets for 6 reps as explosive as possible? Set 6 – 195 pounds for 3-4 tough reps to failure. The athlete is still doing the same amount of reps for the exercise in both templates. As you can see, the addition of one extra set of 6 reps makes this one exercise become a blend of explosiveness for the first 3 beginning sets, and strength for the last 3 sets. Instead of moving the lighter weight slow and steady, he is now moving the bar with as much speed as possible. Every week simply increase the weight by 5 or 10 pounds and decrease the reps by 1. After 3 weeks, change the exercise slightly (move to an incline press or a dumbbell press) and follow this same template for another 3 weeks. This can be done with all of your basic compound lifts like squats and bench press. You will see great increases in speed and explosiveness without a decrease in strength. Another strategy is to replace a standard compound or isolation movement with a similar exercise focusing on explosion. For example, on the days that you have your athletes squatting, you may have them also doing a lunge variation. Rather than do the lunge in a typical slow and steady manner, why not change the exercise to a jumping lunge? Walking lunges holding dumbbells – 3 sets of 10 reps – slow pace – focus is hypertrophy. Repeat Jumping Lunges – 6 sets of 5 reps – explosive pace – focus is producing massive force. (Both are lunges, both very easy to teach, but two separate results). The same can be done by switching a dumbbell bench press to an explosive push up, or exchanging a leg press or leg extension with a repeat jumping squat. A third strategy that you can use that works great with larger teams or if you have limited time is to superset an opposite explosive movement immediately after a strength exercise. For example, if you have your athletes doing a typical 5 x 5 strength template and you have 4 athletes sharing one piece of equipment, you are inevitably going to have athletes taking a large amount of rest between each set while the bar is loaded and unloaded. Instead of having the athlete finish his set and sit down for a few minutes of rest, have him do an explosive movement immediately after his set is complete. Superset with clapping push ups – 5 sets of 5 reps – perform immediately after squats. This is a great way to blend a strength based exercise with an explosive exercise. With this strategy, just make sure that the explosive exercise is opposite (uses a different movement pattern) than the strength exercise. So if the main strength exercise is a bench press, superset with an explosive jumping movement. In my experience, supersetting an explosive movement with a strength movement that is too similar will be counterproductive. The athlete will be too tired to produce the energy necessary to lift heavy and the heavy lifting will prevent them from being explosive. Truly a lose-lose situation. Neither exercise will accomplish what it sets out to do. Properly implementing these strategies should be done gradually so you do not throw off whatever progress you have accumulated thus far. Don’t completely revamp your training templates and switch around what your team has been doing. Take one strategy from the three above and implement it for the first 4 or 5 weeks of the season. Test it out with your team (certain sports and athlete body types respond to each strategy differently) and see if the response is favorable when they play their sport. If it is, try to incorporate an additional strategy for the next 4-5 weeks and see how your athletes respond. If your athletes show an increase of explosion in their sport, you know what you are doing is working. If your athletes are looking lethargic and are gassing out during their weight room sessions, that is a sign to pull back and decrease the amount of explosive work. Whatever is done in the weightroom should enhance what is done during competition. You are training athletes. They can’t be bodybuilders in the weightroom and athletes on the field. They can’t be Olympic lifters in the weightroom and athletes on the field. They can’t be powerlifters in the weightroom and athletes on the field. Train them like athletes by blending their strength training, explosive movements, and hypertrophy in the weightroom to compliment what they do in their sport. You will see over time that their explosion increases along with their strength and muscular size. DIESELS, Coach Ellis and I worked together on a project last eyar and we are about to release it. It’s called Grip Training for Track and Field Throwers. You can get on the early bird list for this DVD release by adding your email to the box below. You’ll be the first to know about it when it comes out. All the best in your training – Grip for Throwers comes out next week! A few weeks back, I invited my personal training client, Mark, to come train with me on a Saturday. He travels a great deal in his business, so that particular week he was unable to train with me at all, so i thought this would be a good way for him to get some work in. That day, it was a great workout. We really got a lot of good quality work in, so I told him if he wanted to do that session with me each week, I would not charge him for the session, and he agreed. This past Thursday morning, we were supposed to train together again, but his flight schedule got changed, so he wasn’t going to make it in. And so he called me on my cell while I was warming up and let me know he wouldn’t make it. I normally train in the afternoon, so I almost said screw it and went back upstairs to work, but instead I hit the workout solo, and I am glad I did because it was awesome. A little tribute to two of my best friends, Rick Walker and Mike Rinderle. Thanks for always having my back guys! I dedicate this workout to you. I have had a lot of incredible and unforgettable workouts in the past. For instance, I’ll never forget the time I deadlifted 405-lbs one repetition every minute for about an hour and then ended up with a total of 100 reps in 75 minutes or so. I remember marathon training sessions doing strongman training out in the yard with half a dozen or more friends on more than one occasion. These were the types of workouts where you just knew it was going to take two or three days to recover from them, but you were having so much fun enjoying training that you couldn’t stop. And I’ve also had days where the lifting I did was no fun at all, in fact it was downright scary, like the time I found one of my long-time friends tipped over in her SUV after a car accident on Christmas Day a couple of years ago and had to pull her out to safety. But the toughest lifting of my life, in fact the downright scariest lifting of my life, took place yesterday. Now, ever since I was 12, I have been known as the tall guy. I was almost as tall then (6 feet) as I am now (6’ 2”), so it wasn’t unheard of for a teacher to ask me reach something for her in a classroom or for an elderly person to tap me on the shoulder at a store, or even for my grandmother to call me to come to her house and grab something. But now, as an adult, since I worked at a company with a 1200-employee roster where I met about 3000 people from 2001 to 2010, and I was practically the only guy there that lifted weights seriously, I was also known as the strong guy. There haven’t been that many requests to help move stuff, but there have been a few. And if it is someone that is a genuine friend, I always go help them out as long as I am not sick, hurt, or out of town. I soon found out that this particular lathe, which the original owner used to craft replacement parts for guns, and that it was also upwards of 600-lbs. In fact, when it was first purchased by the original owner, the factory wouldn’t touch it. They had it strapped to a pallet, lifted it with a fork truck in order to load it into the owner’s truck and then they said they had no responsibility for it whatsoever. I also learned that this lathe was extremely unbalanced. Talk about odd object lifting, 400 of the 600 pounds were on one side and then the rest of it was spread throughout the rest of the nearly 4-feet of length of this piece. Also, I’d estimate the head of this lathe stood about 2.5 feet in the air, making it extremely top heavy. I chatted with the original owner for the first few minutes and he told me some stories about being in Kuwait during the most recent gulf war and also time he spent in preparation for Desert Storm, although he never went over. His tale of a trip from one city in the Middle East to another city 8 hours away just to test fire some equipment in an area with enough sand dunes for a good backdrop in 150-degree plus heat seemed to be an eerie foreshadowing of what was about to come as we embarked upon our trip to relocate this immense lathe. Not sure how good at lifting lathes these guys are…? After a couple of his stories, I heard some cars pull up and I saw the new owner, another man of about 50+ years old and two other men who I know are in their 40’s. The original owner would be of no assistance in the move, as he has a very banged up knee from his time fighting. Also, the girlfriend in the car ended up never even touching the lathe throughout the whole entire day. I knew right away that this move was not going to be an easy one. I knew all three of these men very well, and none of them did any sort of regular exercise aside from their day-to-day jobs. In fact, I think all of them were full-time smokers putting away at least a pack a day. Let’s just say it was clear without stating it that I would be carrying the heavy end of the lathe. We began assessing the weight, bulk, positioning and other factors about the lathe and how it would be best for us 4 guys to move this thing off a 4-foot work bench, 5-feet to the doorway and then another 4 feet to the truck. At the same time, the heavier end of the lathe had some sort of a gear box in it that wasn’t very sturdy, so it would not serve well as a spot to hold it. Instead, the holding spots were four 4-inch handles that could be pulled out. Unfortunately, they were almost completely even with the bottom of the lathe, meaning we could not get our fingers under the handles unless we tipped the lathe up using a sturdy object like a board. Of course, every time we did that, the top-heavy 400-lb end of the lathe would try to completely turn over so we had to be very careful. We got into position, holding what we could, and attempted a lift. With these three guys, it would have been impossible. We stopped the job and two of the guys went to get another guy, a friend of theirs from a nearby bar. Fantastic. Another helper whose the better part of a 6-pack into a Thursday night bender. Awesome. That took about 45-minutes, as I believe the two guys that went and picked up the 5th guy had a can of Old Milwaukee inside the bar, but they finally got back and I was relieved to see the 5th guy in the equation was about as big through the belly as he was tall. Again we planned and postulated the best methods for moving the lathe. This time, we decided that instead of crushing our fingers with the lathe’s actual handles, we would use ratchet straps wrapped around our hands in sort of a human-link type of fashion to support the weight of the lathe. This was my idea as I had seen some sort of professional movers’ commercial on the Yankees Sports Network utilizing straps, and it seemed to work very well as we were able to pick the 600-lb lathe up and move it the 5 feet toward the doorway. Unfortunately, once we got to the doorway, we were in trouble. The doorway was just a regular-sized doorway and there was no way for me, the lathe and the guy across from me to all fit through the door at the same time. As we all strained to support rh weight of the lathe, I tried to let the guy across from me go through the door first. To my dismay, not only did his shoulder or elbow knock a phone off the wall (and I am talking one of those out-dated phones with the obscenely short spiral cord on it) but he also got one of the little “spinny-turny” (sorry, I don’t know the terminology) handles of the lathe caught inside one of the shoulder straps of his wife beater. Yes, he and his brother both were wearing the plain-jane white wife-beaters like Eminem, and matching faded black stone-washed jeans. I am not creative enough to make this stuff up. Incidentally, I think Eminem could out-lift all four of my partners, put together. So once this handle got stuck in this guy’s favorite wife beater, he started to panic, which in turn caused all the rest of us to panic, and before I knew it, the lathe was on the floor. I don’t know how it didn’t end up on someone’s foot or over on it’s side, but it was still in one piece, an unscathed lathe, if you will. Once we got outside, it was time for refreshments and recovery. I was given a Pepsi, while the other gentlemen somehow managed to score more cans of crisp, clean, Old Milwaukee. We took a break and I watched the original owner of the lathe throwing this mangled dog toy out into the grass and then his dog, which I am told is a cross-breed between a one sort of nice, peaceful kind of dog and a Dingo. If you don’t know what a Dingo is, they are these fierce, crazy pack-hunting dog-like creatures from the Australian outback which are famous for eating children. They get wild like an LSD Zombie. This dog would jet across the yard like a flash and would nearly catch the dog toy in the air, or sometimes on one bounce and I thought that it would probably be real tough to beat him in a game of Kickball 500, where you kick a ball back and forth to a guy and they have to catch it either in the air or after as few bounces as possible because they get fewer points after each bounce, and you go to 500. The original lathe owner told us that he was walking the dog one night around 10:30 PM and a pack of 6 coyotes came up along the trail and his dog, Mr. 500, killed 3 out of the 7 of them by gripping their bodies in his mouth and shaking them until their necks broke. After everyone finished their cold one, we tackled the lathe once again, utilizing the straps to the best of our ability. This time, the lift wasn’t nearly as hard, but somehow the original owner with the bad knee got involved and somehow crushed one of his fingers to a certain degree, but I am not sure how bad. We pushed the lathe further into the bed of the truck and they took one of our ratchet straps and harnessed it down. The new owner drove very carefully with his new toy the entire 5 miles back to town where he lived. I am pretty sure I could have scored perfectly in the full first round of Angry Birds, playing one-handed during this drive, we were going so slow. 1. The two brothers, the girlfriend, and the guy from the bar all of a sudden took a mysterious detour. I was in the end of the caravan, and then they turned off the road and I was now driving behind the new owner. I followed him the rest of the way. He continued to drive very carefully throughout town, that is until he got to his driveway, at which point he decided to seemingly “floor it” and I saw the lathe wavering back and forth like a buoy out on the ocean. 2. Finally the two brothers with matching wife-beaters and faded black stone washed jeans came pulling in with a giant monster truck looking vehicle following them. To our surprise, they had enlisted the help from the brother of the 5th man in the equation, who had also been at the bar drinking as well. We were now 6 strong. The last part of the job would be to lift the lathe out of the truck and move it into the new owner’s machine shop, which was very dark and extremely hot. The idea was to put this 2 by 6 board beneath the lathe and then carefully rock the lathe over the edge of the pick-up truck’s gate and then slide it down the floor. Good, efficient idea right? Immediately upon trying this, the lathe started to slide all over the place and it nearly fell out of the truck. So at this point, I am starting to get scared. Not only are these guys up in years, but they are also severely out of shape and now fatigued (not to mention some of them half drunk). We decided to get the 2 by 6 board out of the equation completely and we got extra straps, this time, legitimate 3-inch broad tow straps in order to lift it up from the bed of the truck, and then one of the women’s wives would pull the truck away and we would gently set it down. We were getting smarter with each step of the game and we were able to lower the lathe out of the truck very easily when the wife pulled the truck out from under it. Now it was a matter of pulling the lathe in through the door of the shop. I hooked the original ratchet strap under the heaviest part of the lathe and with both hands performed a partial deadlift and then scooted it backwards on top of the step-up leading into the building. There was no work bench. Instead of a work bench, the new owner had a wobbly particle-board table. I couldn’t believe my eyes. It looked like it would snap if I leaned against it, let alone if we loaded it with a 600-lb lathe. The new owner assured us it would hold, as apparently he had been storing something else of a comparable weight on that very same table. In our final lift of the day, we hoisted the lathe up onto that table. During this maneuver, I was clenching the straps that were wrapped around my hands so hard that I popped seemingly every blood vessel in my left hand. The lathe also was sat upon the new owner’s leg for a short time before it made its way fully to the table. All 6 or 7 guys that helped on this lift (I had tunnel vision at this time, so I don’t really know who all pitched in) were huffing and puffing, thinking we were done. I say thinking because we had made one critical error in our planning process – the “spinny-turny” handles were positioned facing the wall, and the back of the lathe was facing out. We then had to turn this thing all the way around in order to get it facing out the right way. At that point we were done with this insanity, and I made my way home to be with the family. While the temperature never hit 150-degrees and the trip didn’t take 8 hours down and back, it still seemed like a nearly endless affair. Earlier, I called this the Scariest Lifting Session of my life, or something like that, and the reason is because it was downright scary how out of shape these men were. I found myself not only worrying about my lifting form and how to keep this monstrosity balanced so it didn’t clip off one of my fingers or jack my back, but I was also trying to best situation these guys based on their height and abilities so they didn’t get hurt as well. All of these guys have manual labor jobs they do, so through my head was running all of these thoughts like how I could make it easy on them as possible, but there was no EASY about this at all. It made me glad to be in good enough shape to carry the brunt of the work through many of the efforts but at the same time, I was just in disbelief. I never want to be in that position. I started lifting all those years ago so that I could be in shape all throughout life. So that I could be the grandfather that all the kids talk about as the strong grandpa. I hope this is why you train as well. Sure numbers in competition are impressive. But the most important thing is about being healthy. The strong, the size, and the power should all be the by-products or the coincidences of being healthy. Keep that in mind DIESELS. I don’t want to sound like I am preaching, but my eyes were certainly opened up yesterday. All the best in your training and health. P.S. I am very thankful that we got the lathe to where it needed to be without any serious injuries and without damaging the equipment. P.P.S. If you are looking to get back into the game, you might want to start with Bodyweight Bodybuilding Secrets from Zach Even-Esh. This is a huge packaged program and it is on sale at a big discount until Midnight Tonight. SO if you need to get back to form, this is a resource you might want to check into. In Part I of this Build Muscle The Right Way Article Series, I spoke about the three most important keys I use for building muscle and gaining strength at the same time: Multi-joint Movements, Training for Power and Speed, and Working for Muscular Balance. You can read Part I here: Keys to Muscle Building. In other words, I go Push, Pull, Lower, Grip for the first week and then flip flop the Push and Pull so it goes Pull, Push, Lower, Grip the second week. Here is a recent workout I did for Upper Body Push. This workout took place on a Monday. It was followed by an Upper Body Pull Day on Tuesday and then a Lower Body Day on Thursday. One week later, I followed the schedule and did my Upper Body Pull Day first and the Upper Body push day second, etc. 2. Bench / Incline Bench: Because the body is supported on the bench, even after doing a big movement like the Overhead Variations, I still feel strong on the bench going second. 3. Auxiliary Bench Movement: Examples could be Speed Bench Against Bands, Incline Bench, Dips – All these are awesome, especially if your shoulders are feeling good. On this day, I started off with Bench Press, although often I will actually start off with Overhead Press, especially if I am using the Log. I was able to work up to an unassisted single of 365 on the Bench Press, for the first time in about a year. My all time best is 405 with a spotter. In order to perform this one correctly and get the most out of it, you should be moving the bar much quicker than this. I should have either used lighter bands or lightened the bar weight, but I did not. My back was feeling a bit seized up after the heavy benching, because I was actually arching pretty hard for me. That is about all the angle I get. If I worked on my thoracic mobility more, I think I could get a better arch. Anyway, because my back was tight, I stuck with Military Press instead of a more powerful movement. Like I said, I like to do a Push Jerk, Push Press or a straight out Jerk movement first, but it didn’t work out that way this week. This is a combination I never even knew about until I reviewed the book, Vince Gironda, Legend and Myth. In that book he has what he calls the 8 Sets of 8 Keep-You-Honest Workout and the finisher for Upper Body Day is Side Laterals followed immediately by what he calls the Dumbbell Swing, but I have affectionately called it the Pirate Ship. Regardless of what you call it, it mimics the movement of the Pirate Ship ride at the amusement park in the way the arms swing rhythmically back and forth. I don’t want to say that this movement pairing or even that just doing the Pirate Ship movement “fixed” whatever was aching in my shoulder the last few weeks, but after doing it every week for roughly 6 weeks straight as my finisher for my Upper Body push day, my shoulders have felt outstanding! I was able to perform dips pain free, getting my rib cage to touch the cross-bar on my dip station for the first time I can remember in years, and I was able to Bench 365 touch-and-go style for the first time in ages. I encourage you to try this out. At the very least the combination pumps your shoulders with a very nice burn. This is how I set up the strength training muscle building workouts. Because I work a variety of percentages of 1RM, a variety of speeds, and train volume as well, I have been fairly successful at building muscle and strength at the same time as long as I am eating enough calories, staying injury free, and getting enough sleep. I have had several months in a row now where I have been free of lower back injuries so I have not missed many workouts and recently my strength levels and size have increased. Now that the latest Grip Contest, Gripmas Carol 2011, is out of the way, I plan on adding conditioning work back into my weekly routine separate of my workouts and cleaning up my diet as well in an effort to trim down a bit and get just plain ripped to shreds in 2012. If you want to watch some of the stuff that I do for conditioning and fat loss, I can certainly film it, but only if you are interested. I don’t know if this is something you want to see or not on my site, so please leave me a comment an let me know. For further information on building muscle, check out Smitty’s AMD Program by clicking the image below. This is one of the best Muscle Building Programs on the market, shares many of the same principles I am sharing here, and includes many other ways to keep you healthy and balanced in order to build muscle the right eway. I was able to train some heavy Grip Stuff tonight for the first time in about 6 weeks, and it felt great. On a whim, I decided to set up T-Bar Rows using a barbell with one loading sleeve jutted up against the G-Rex and used a Rope as the gripping surface and to my surprise, it felt OUTSTANDING! In fact, I liked it so much, I ran up and got the camera to film some of it. In this first video, I show you how to set this up in case you haven’t tried it before. This lift will work just about ANYWHERE as long as you have the equipment, so give this one a try. I literally just walked back in the door from meeting my tee shirt guy, Bill. He handed me four new sample tee shirts with the new Skull design I just got done by Stronger Designs. Check these out…they are a solid shirt color with two inks in a stressed print format. IMPORTANT: When you make your order, be sure to (1) Select a Size, (2) Select the Color of the Shirt, and (3) Include the Ink color combination in the Note Section. Some combinations are shown below, but I can get them made to order. One of the biggest problems I see in high school, college, and professional baseball players is their off season training program. Too often I see these athletes performing the WRONG exercises. Some athletes focus on the “beach muscles” that don’t have any positive effect on performance. Others will only train their “core” and do rotator cuff work. While it is important to train the core and rotator cuff, by no means should they be the meat and potatoes of your program. Instead of focusing on these exercises that don’t have any positive effect on athletic performance, baseball players should perform compound lifts. These lifts give you the best bang for your buck and help you optimize performance. Once the baseball season approaches, baseball players should start to include more jumps, medicine ball throws and sprints. Below is a list of my top 10 lifts for baseball players in the off season. Jordan Vezina, RKC, recently uploaded his entire DVD, “The Corrections,” to YouTube. I have had this DVD in electronic version since it first came out back in like 2008. Jordan is very knowledgeable about correcting technique and I even reviewed it prior to going to the RKC in September. It’s not everyday that someone uploads an entire DVD on their own accord, especially a good quality one, like Jordan’s. If you’re new to Kettlebells or if you’ve acquired some bad habits, you may want to check these out. If you’d like to see what else Jordan has to offer, check out his YouTube Channel, his website, AverageToElite.com, and his blog, StrengthBeyondStrength.com. Now, check out the various sections of the DVD. Hope you enjoy it. And if you do, make sure you shoot Jordan a note at one of his sites or leave him a comment on his YouTube Channel. No doubt you love your strength training and want to get the most out of it, whether you are a strength enthusiast, athlete, or coach. 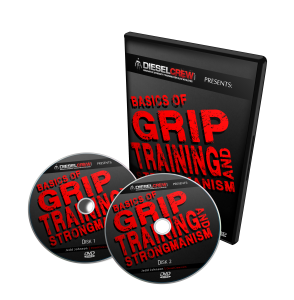 I’ve spoken for years with you about the importance of including Grip training in the strength training program. However, although everyone knows grip training is important, sometimes they have trouble figuring out where to put it into their program. The way I do it is this: I complete my warm-up and either upper or lower body training in the first part of my workout and then I go into my Grip Training after that, essentially having another completely separate workout for Grip that sometimes lasts longer than the upper/lower body training I’ve done. Full workouts devoted to Grip Training are not a necessity for most people. I do it this way because I compete in Grip Contests. This kind of volume would be a waste of valuable time for most people and likely lead to injuries due to not being conditioned. In most cases, it would be better for you to use Grip training as the “dessert” for your workout, something that you add in at the end. I actually do this quite frequently, especially when I de-load my grip or if I have no contests coming up. I will devote a little extra time to my upper/lower body training, and then pick one or two Grip movements that I will do for only 15 or 30 minutes to stimulate the grip that day. Here are some of the movements I use most often for Grip Finishers. I have grown to absolutely love training with the Mace. I use the Stronger Grip Mace/ Core Club from StrongerGrip.com. The dynamic nature of the Mace Swing causes you to clamp down hard with the thumb and the last two fingers. I also like to wear gloves on these to make the Grip emphasis even more challenging. VOLUME: I like to hit 4 to 6 sets of 20 repetitions with my Mace, alternating between having the right hand and left hand on top each set. Also, what is great about these devices is that their weight is adjustable. They are filled with shot through a hole in the head and you can get started light and gradually work up as your technique gets better. If you’re interested in picking up a Mace, click here => Stronger Grip Mace. I work with Ryan at SG as an affiliate, but that isn’t why I recommend them, it’s because these things are cool, tough, and fun! Club Swinging is similar to Mace Swinging in that the movements require a strong grip in order to perform the movement correctly. If you have weak hands or wrists, then there is no way you can do a lot of the movements with the Clubs unless they are very light. I keep the clubs loaded to capacity with steel shot and keep the movements simple in order to focus on dynamic hand and wrist strength. One thing you may not realize is that Clubs and Maces also require substantial engagement from the lats in order to perform swings with them, especially if you are going heavy. For that matter, I like to hit some simple casting movements with my Club prior to bench, overhead press, and pull-ups. VOLUME: I like to hit 3 sets with each hand. I stick with groups of 12 reps. The first set is done with a regular cadence, starting with my hand near my rib cage and ending there as well. I then do a set that involves quite a bit of momentum and speed, focusing on whipping the Club forward over my shoulder back to the order position. My third set is then done with a dead stop behind my back and then blasting back to the order position. This really is great for stretching the tricep and loosening up the shoulders. There are literally dozens of more variations you can do with these, especially if you stay very light, but I generally stay on the heavy side for that Grip Strength emphasis. Forearm Rotation (Pronation and Supination) is a must for anyone who plays sports and runs the risk of developing forearm pain like epicondylits (Tennis Elbow and Golfer’s Elbow). When I do a good job keeping this in my routine, my forearms are pain free. I’m guilty of complacency just as much as anyone though, and sometimes I do forget, but for the last couple of months, I have been hitting these at least once per week again and I am feeling solid. For years I did Forearm Rotation stuff seated with a sledge hammer, but I have been getting a lot more stimulation recently by doing them standing with my forearm parallel to the ground. I often just use a sledge hammer or a leverage bar, but Stronger Grip also has a loadable Leverage Ball that I used with my baseball players when they were coming in the Summer and early Fall. I think these things are great for Baseball and Softball players and I think they would also be great for Football players, especially Quarterbacks and Running Backs/Kick Returners because it requires a more Open-Hand position while maneuvering the forearm than sledge hammers and leverage bars do. This is where to get your Leverage Ball => Stronger Grip Store. VOLUME: I like to hit 3 sets of 10 to 15. 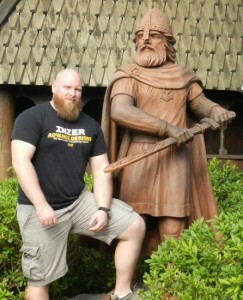 I like to move the hammer really slow in order to feel it the whole way up my forearm. You saw my recent post on kettlebell flipping with gloves on. That was VERY TOUGH. But usually I just do these without gloves on and I try to get as many forward flip and catches as possible. This works the Grip big time. It is very dynamic and you must have strong fingers and thumbs in order to reverse the momentum of the flipping kettlebell and bring it back up for another repetition. Kettlebell Flipping also requires a significant work load from the posterior chain, and from the postural muscles in the back and shoulders. Because so much muscular activity is taking place, you get breathing very heavily, so this one has the added benefit of increasing your conditioning as well. VOLUME: It really depends on how I am feeling and how rusty I am. When I do these regularly, I can hit 20 in a row alternating between hands, no problem. My hands get slow if I haven’t done it in a while, but I shoot for 4 sets of 12 to 20 reps with the 95-lber. Dragon Door makes outstanding Kettlebells. You can buy them here => Dragondoor Kettlebells. I honestly feel that this may be the toughest Grip Exercise I ever “invented.” And when I say invented, I simply mean I came up with it on my own. For all I know the Mighty Atom or Slim The Hammer Man might have been doing this for decades before I even knew what Grip training was. Sledge Hammer Chain Twists literally hit every single aspect of your lower arms. In order to do these right, I am convinced you HAVE to use a chain for accommodating resistance. I like to just wrap the chain around the sledge handle and tape it on with athletic or duct tape, otherwise it may slide around on you while you are working the movement. VOLUME: I generally do just one set with the right hand on top and one set with the left hand on top, because these are brutal. I use a hammer that is 8-lbs and then the chain is like 20-lbs, so it gets pretty heavy. Sledge Hammers are available all over the place – hardware stores, amazon, different sites. Just google it and you should be able to find something, but get something you like because they are pretty expensive. Look, you know you need to work your Grip and what you do for it needs to be high impact. If you are looking for High Impact ways to get strong from the elbow down, these 5 ways have my backing. It is true that there must be a balance with all training. Unfortunately, the “go” muscles of the posterior chain are most often neglected in strength programs. Lower back issues, hamstring strains and unrealized strength potential are just some of the everyday issues you will face if your training programs don’t include unilateral training AND strengthening the posterior chain (lats, erectors, glutes, hamstrings, gastrocs, soleus). Powerlifters, athletes, strength enthusiasts, meat heads, weekend warriors and everybody else must incorporate exercises that target the posterior chain in their lower body training days. Not only for increasing your lower body strength potential and reducing your risk for injury but making sure you don’t end up looking like a lightbulb (big upper body and no legs). Regardless of the exact percentages, we need to understand the basics. The surrounding, supportive, antagonistic muscle groups for each kinetic segment must be developed to ensure the integrity of the engaged joint. That is the basics, bottom line. Simple, right? In this article we are showing an advanced version of GHR’s. Instead of overloading GHR on a GHR bench, we are going to increase the intensity by elevating the back end of the bench with a box. Because at this angle, there is constant tension on the hamstrings and there is no release of the tension. Also more of the lifter’s bodyweight is being utilized. These are no joke, trust me! Try them out and let me know in a comment below. Which muscles are engaged with GHR’s? Many people don’t have access to a GHR bench. If you don’t, you can perform natural glute ham raises. This is a glute ham raise performed on the ground with someone holding (anchoring) your feet. You definitely want a pad underneath your knees for this one. They are much harder than GHR performed on the actual GHR bench. As always, these too can be progressed if you are super strong. Check out the variation below. A partner will hold the lifter / athlete’s feet while they perform GHR’s. This variation is much tougher than the variation done on an actual GHR bench because momentum and pad angle plays a huge role in the moment arm and percentage of the lifter’s bodyweight that is utilized. This variation is done on a decline sit-up bench. Because of the angle the intensity and strength requirement is off-the-charts. Only your elite athletes will be able to do this. As always, to aid in the concentric phase of the exercise, a plyometric push-up done off the bench can be incorporated. When do you use GHR’s? They should be used in conjunction with squats (all variations), deadlifts (all variations), kettlebell swings, barbell hip thrusts, sprinting, etc… on your lower body days. 2. Kreis D.A., E.J., Speed-Strength for Football, Taylor Sports Publishing, 1992. 4. Schache AG, Crossley KM, Macindoe IG, Fahrner BB, Pandy MG., Can a clinical test of hamstring strength identify football players at risk of hamstring strain?, http://www.ncbi.nlm.nih.gov/pubmed/20697691, Aug, 2010. 6. Siff and Verkhoshansky, Supertraining – 6th Edition, UAC, 2009. It has been stated that a non-chemically enhanced lifter cannot get stronger while on a fat loss program. The popular justification for this claim is that in order to lose fat, you need to create a caloric deficit through dieting and higher volume training. And caloric deficits are NOT conducive to gaining strength or building muscle. This is why when most people want to get stronger and/or bigger, they go on a high calorie diet and reduce their training volume. Unfortunately, this usually results in unwanted gains in body fat. It’s a classic catch 22 scenario. Then, when they try to drop their recently gained body fat, they usually follow a typical fat loss protocol (low carbs/low calorie diets, high intensity cardio, high volume resistance training), and although they may lose some fat, they can kiss their strength gains goodbye. And then they are right back where they started. Does it have to be this way? Or can you lose your unwanted body fat while INCREASING your strength simultaneously? The good news is yes: you can (and should) increase strength while decreasing body fat. 1) Target the nervous system with your training – To a large degree, your strength is a function of the efficiency of your nervous system. This is because your nervous system is responsible for synchronizing and activating your motor units. For those of you who don’t know, a motor unit consists of a bunch of muscle fibers and a motor nerve cell. Increased synchronization and activation basically means you will be able to utilize more motor units per contraction. This phenomenon will increase your strength dramatically. How do you target the nervous system? Well, there are two ways to make significant neural gains. The first is to lift heavy weights. In fact, the weights must be 85% or more of your 1 rep max. This will result in performing sets of 1-5 reps each. The second way is to move the resistance at high speeds. Any type of explosive movement will do the trick here. Examples of explosive movements are jumping, plyo pushups, Olympic exercises and various med ball drills. It is important to note that the nervous system can take up to 10 times longer to recover than the muscular system can. Therefore, in order to maximize this training technique, you should be sure to get near full recovery in between sets. For an experienced lifter, this could result in up to 4-5 minutes between sets. 2) Maintain or increase your lean muscle mass. This is critical, because even if you make neurological gains, you can still compromise your strength if you lose muscle tissue. There are two things you must do to increase muscle mass during your fat loss program. The first muscle boosting trick will involve your nutrition. The key is to NEVER stay sub caloric (below maintenance level of calories) or carb depleted for more than 3 consecutive days. Obviously you will need to reduce calories in order to lose fat. Just don’t keep them low every day. Keeping them low everyday will result in losses in lean muscle mass. Instead, lower your calories and carbs on light training or off days and then INCREASE both carbs and calories on HEAVY training days. The second trick is to include some hypertrophy sets in your routine. Hypertrophy sets involve using a weight which allows you to get 6-10 repetitions. The key is to keep the volume low on these sets. Do not exceed more than 4 total hypertrophy sets for each movement pattern. More than that can result in overtraining and/or muscle loss. Additionally, these sets should ALWAYS follow your heavier neural sets. 3) Stay hydrated and nutrient loaded. Training at high intensities while dieting can result in dehydration. This will decrease your strength and thus negatively impact your workouts and future gains. The obvious way to try and combat this is to drink plenty of water. Be sure to drink a daily minimum of half of your bodyweight in ounces of water. Although drinking a sufficient amount of water is important, it is not enough all by itself to maintain a high level of strength performance. Additionally, 30-45 minutes before your heavy workouts, consume a liquid meal consisting of 30 grams of protein, 500 mg of magnesium, ¼ tsp of salt, 5 grams of glutamine, 5 grams of BCAA’S and 60 grams of carbs. This will help jam nutrients into the body, thus improving workout performance. 405lb Trap Bar Deads for 20 Reps! I also performed a similar before and after test using a Military Press. Those were the only two exercises I took maxes on. These are very good results. For strength athletes, the benefits of this protocol are obvious. But this is incredibly beneficial to anyone who looking to lose body fat as well. Give this protocol a try, You’ll be glad you did! Finally, a new video compilation of training here at the compound. I haven’t made one in years, but the last video compilation I made inspired so many. Hopefully this new video will do the same. It contains some never-before-seen footage and exercises guaranteed to kick your training programs in overdrive. As always, please click on the video itself and when it takes you to YouTube, please “LIKE” the video at the bottom left. It really helps with ranking! Here is a quick video showing you how to setup your own wrist roller with minimal equipment. I saw this technique being utilized by Mike Rojas of Strong 101 Gym. Here is the equipment you need. * Rope setup – if you use the rope setup, you might need some duct tape to adhere it to bar so it doesn’t slip around. Also, when we have used the rope setup, we tied a carabiner to the end of the rope to loop around for quick change around. As we move from the strength phase of our training it becomes necessary to start incorporating movements that build strength endurance and stability. We must also engage in exercises that allow us to transition to more dynamic movements; such as submaximal plyometrics. This is in preparation to handle the ballistic forces in the upcoming explosive / jump training phase. It is true that isometric exercises strengthen +/- 15-20 degrees of the joint angle being engaged (2). What happens if we incorporate isometrics all along the strength training movement pattern through the eccentric (lowering / yielding) phase. We get dynamic isometrics. “Dynamic isometrics is now known as explosive isometrics. ” The explosiveness comes from the fact that after the isometrics are engaged, compensatory acceleration (CAT) is attempted. CAT is taking the weight and moving it as hard and as fast as you can (think tempo “x”). As you can see in these images and this video, we utilize a giant cambered bar for our squats. This is essential when working with all athletes to prevent shoulder irritation and gain a proficient squat while you are still working to improve thoracic mobility. Each position is held for 3 seconds and there are 3 position for each repetition. Approximate time under tension (TUT) is around 30 seconds each set. An altitude drop is a abbreviated form of a depth jumps (Verkhoshanksy). You step off of a box and land and stop the movement as quickly as you can. We do NOT ask the athlete to reverse the movement, ONLY absorb. 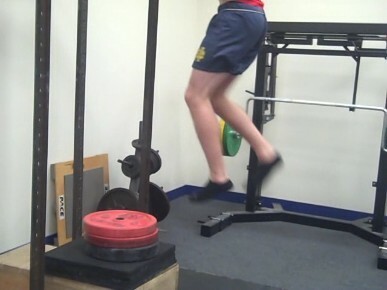 Remember, we are using this submaximal plyometric to prepare for the next phase which will include the full execution of the depth jump AND many other upper and lower body explosive movements. In our example, we are also modifying it slightly to increase its benefit for the athlete. As you can see in the pictures and video, I modified the altitude drops two ways and improved its base benefit profile. 1. I did not have the athletes stop immediately on the landing. We are still in preparation mode for our plyometric phase and the athletes are still learning to land proficiently. So we want to reinforce the landing mechanics and develop the eccentric strength to absorb the impact. We ask the athletes to land softly. This is a great transition to the full execution of the movement. 2. I also did not start the movement just by dropping off the box. I added specificity to the altitude drop by preceding it with a dynamic step up. 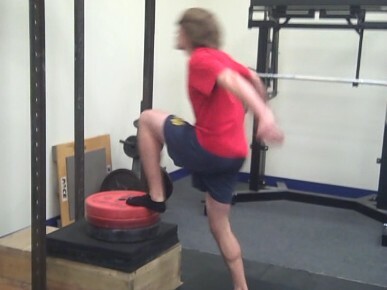 The goal was to get the knee higher than the hip to promote not only hip mobility but strength mobility (ie. strength in this new ROM). This is an amazing modification. You can also see the movements were performed in bare feet and the athletes were landing on a soft platform, ie. a wrestling mat. The athlete must possess a solid strength foundation before attempting either dynamic isometrics or shock training. Finally, volume is of concern for both of these heavily CNS intensive exercises, so monitor carefully.